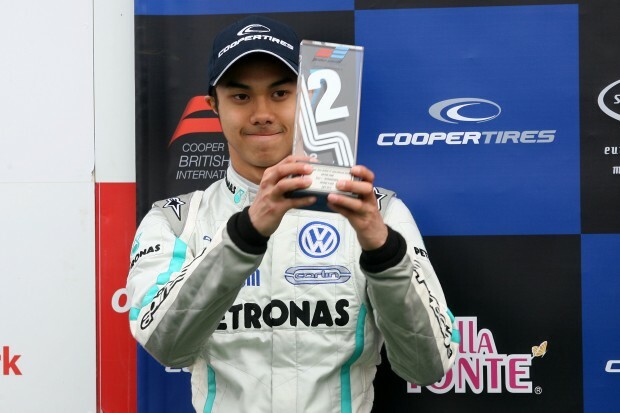 Jazeman Jaafar collected two trophies in the opening event of the 2012 International British F3 Series taking place at Oulton Park in Cheshire this weekend. A solid drive to second place in the first race of the season was followed up by a storming race from eleventh on the grid to third place in the second race and a fifth place finish in the final race of the day. These strong results have put Jaafar second in the overall Drivers Championship, just behind Carlin team mate, Jack Harvey. Jaafar was consistently strong in the practice sessions ahead of the weekend’s racing and he continued the momentum into the qualifying session, putting in fifth quickest lap to line up in this position for the third race. His second quickest lap of the session was third fastest of the field, giving him third on the grid for the start of the first race. With Carlin team mates Jack Harvey on pole and Harry Tincknell in second place, Jazeman was in good company at the front of the pack. When the lights went out for the start of the race the young Malaysian was quickly off the line, squeezing between Harvey and Tincknell as they raced down to the first corner, taking second position from Tincknell as they exited the corner. The PETRONAS-supported driver held position as the race settled down, with his times dropping as the laps unfolded. Harry Tincknell, behind in third was chased down by Carlos Sainz Jr, eventually conceding the place to him. Jaafar was ahead and soon Sainz Jr was chasing him down, but with evenly matched pace Jaafar was able to hold position until the chequered flag. The reverse grid format for the second race of the weekend put Jaafar eleventh on the grid for the start. Jaafar quickly showed his prowess, moving up to eighth by the end of the first lap. Over the next five laps Jaafar carved his way through the field, running third after only five laps. With team mate Pietro Fantin ahead in second, Jaafar was keen to wrest the position off him, but a safety car period to retrieve a stranded car which left only one lap of green flag racing at the end, put paid to any chance he had to do this. Jaafar crossed the line in third, to take his second podium place in two races and at this early stage of the season, to lead the championship. The third race, with forty minutes of racing, saw Jaafar line up in fifth place on the grid. The green flag flew and the race down to the corner was frenetic with plenty of jostling for position, with Jaafar remaining in fifth. A stalled car on the grid brought out the safety car before the lap had been completed and the field held position for the next few laps. Racing resumed and the field returned to full speed, with Jaafar, along with the majority of the field, maintaining position and in a fairly processional race, the closely matched paces of the drivers kept the order the same until the chequered flag. The 2012 International British F3 Series continues next week with the second round of the championship taking place in Monza, Italy.